The bodhisattva Quan Am welcomes devotees. Walking up to Hoi Duc Temple in Portland, Maine, the first thing one notices is the aroma of incense. 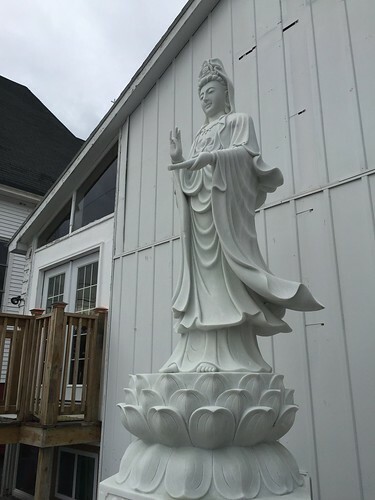 Approaching the modest corner building located in a peaceful residential area, one is greeted with a shining image of Quan Am (Guanyin, Avalokiteshvara), the Bodhisattva of Infinite Compassion, whose welcoming gaze casts benevolence onto this snowy street of South Portland. The incense offered at her feet serves as a portal into this abode of refuge and beauty. Only in residence for three short years, this goddess so loved around the world by Mahayana Buddhists has come to bless and protect a new temple founded primarily for Vietnamese immigrants new to the United States, although its doors are open to everyone. According to the presiding resident monk at the temple, Venerable Thich Duc Minh, Portland already had Thai and Chinese Buddhist temples, but most Vietnamese Buddhists were worshipping in their homes due to the language barrier. Ven. Thich Duc Minh came from Vietnam specifically to found the temple and to serve the growing community here. The temple services dozens of multigenerational families, with daily services, personal ceremonies, special services on Sundays, and cultural holiday events. Inside the temple one is immediately struck by the immaculate cleanliness and reverential nature of the space; it is evident that the temple devotees practice with their full hearts and minds. Offering plates are piled high with ripe oranges, while softly lit candles, supple pink lotuses, and vibrant red and gold lanterns adorn the temple space with a vibrant sacrality. The main shrine room can hold hundreds who come for rituals, meditation, Buddhist scriptural lessons by the venerable, as well as Vietnamese cultural celebrations such the Buddha’s birthday, parent’s day in Buddhism, and the celebration of the Lunar New Year. Incense offered at the feet of Quan Am. After the Sunday service, the community gathers to share a magnificent meal together. Elegantly prepared food by devout temple members is enjoyed and offered to guests with a distinct Buddhist hospitality. Vegetarian beef noodles cooked with ripe winter vegetables are followed by che xox nuoc, a Vietnamese dessert translated as “dessert wading in water,” made of glutinous rice filled with mung bean paste bathed in a sweet clear brown liquid of water, sugar, and grated ginger root. All of this with coconut milk on top reminds one how food and culture are inextricably linked. The mindfulness practiced in the food preparation is evident, and the multi-generational community shares the meal at pristine decorated tables, together with the monk, surrounded by the temple families. Prior to the community meal there is a service. The Sunday services are approximately two hours and begin with a short meditation and end with chanting. Venerable is currently offerings teachings from the Theravada Nikaya, and shares that this has produced great benefit for the community. Currently the only Vietnamese temple in Maine, other monks are invited from a Massachusetts Vietnamese temple to join the larger celebrations. Asked about future plans for the temple, Ven. Thich Duc Minh states that he would like to provide activities for the youth, such as more teen retreats and programs. Just as the fragrant incense wafts through the cold New England street, so too do the vibrations and prayers from inside the temple carry blessings to the urban surroundings. 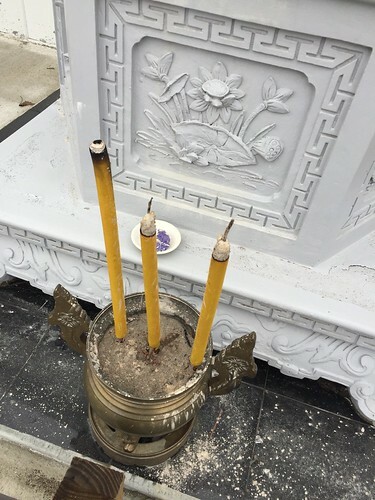 The visual reminder of Quan Am outside the temple is a testament to the potential of Buddhism to bring peace and blessings wherever it travels and is allowed to take root. May the bodhisattva Quan Am continue to welcome and bless the devotees as they endeavor to sow the seeds of the Buddha’s teachings into the next generation and beyond. The author would like to thank the Ven. Thich Duc Minh and temple members for their generosity and assistance in writing this article.